The Department of Justice recently announced that it would examine and not renew it's contracts for privately built and operated prisons. This was hailed by some reformers as a major victory for human rights, the federal budget and the Democratic Party's election efforts. Hillary Clinton is attempting to shore up her flagging support from the progressive wing of the Democratic Party. A major campaign difference between her and Sanders was the latter's pledge to close all private prisons while the former received $133,000 in donations so far in this election from the Correctional Corporation of America ( CCA), which is the largest operator of private prisons. After the criticism grew more pointed, the Clinton Campaign made a typical election year promise to close private prisons. As reported in July by the Intercept, CCA CEO Damon Hininger is completely unconcerned. The Department of Justice announcement this week that it would not renew contracts for private prisons sent CCA's stock prices tumbling. What looks like reform is really stock market manipulation. If this reporter had liquid capital and vaporous morals he would buy buy buy CCA stock while it is cheap. Here is why. Aside from the subjective considerations of election year promises, the DOJ announcement is a policy directive made by an outgoing lame duck administration. It can be reversed at any time, and can be reversed by the incoming administration. It is not an act of Congress or a budget allocation. The contracts are in place, the DOJ is simply not renewing them. Some will in effect until after the 2020 election. The prisons are not slated to actually close. There are no plans to transfer these federal prisoners to actual federal prisons. The cells that were overcrowded yesterday will be overcrowded tomorrow. No no violent offenders are going to have their sentences reduced or commuted because of this. CCA will still get it's checks and prisoners will still work for private corporations at low or no wages tomorrow as they did yesterday. The prison system in America is vast. According to the DOJ, in 2013 (last year the numbers are available for) 2,220,300 people are in jail or prison in the United States. By comparison, the best estimates in a 1993 article published in the American Historical Review give the total number of inmates in the Soviet Union 1953 at a mere 1,727,970. Objectively and mathematically Obama's Gulag is bigger than Stalin's. Federal Prisoners in privately owned institutions tally out at a little over 22,000, or about 1% of the total prison population. Closing the all the private prisons under DOJ contract would simply cause a prisoner transfer of 1%. Nothing else would change even if such a promise from a lame duck Democratic administration in an election year were true. There are no comprehensive objective studies on the truthfulness of campaign promises, so a small will have to suffice. Obama promised to close America's torture farm at Guantanamo Bay “within 100 days of taking office.” That deadline passed 2302 days ago at the time of this writing. Based on the sparse data available, Democratic Party campaign promises to close prisons are proven lies. Should that transfer of prisoners actually happen, CCA would not loose a majority of it's federal revenue. CCA also runs private detention facilities for immigrants. Their no-bid contract with Immigration and Customs Enforcement (ICE) was built by former KKK “Exalted Cyclops” and Democratic Senator Robert Byrd of West Virginia. Byrd inserted the language that "…funding made available under this heading shall maintain a level of not less than 33,400 detention beds.” It is federal law that private corporations get paid for 33,400 beds even if those beds are empty. That is guaranteed tax dollars and a terrific reason to purchase CCA stock now that it is cheap. The private prison industry operates a total of 166,400 beds at last count. The proposed move by the DOJ would shrink that number by 22,000 over 5 years. This is a proposed revenue reduction of 2.6% a year, which is more than offset by under valued prison stock prices caused by unwarranted market panic. Prison stocks remain a solid investment guaranteed by the federal government to pay dividends. This is why large institutional investors such as Bank of America and Fidelity Investments have substantial holdings in the industry. CCA stock price (NYSE: CXW) dropped to $19.08 per share at market close on Friday, leaving it at twice the value it had in January of 2009 when President Obama took office. With $1.7 Billion in profits last year, a 2.6% reduction in gross revenue would hardly cause this stock to fail to yield high dividends per share as it has historically. 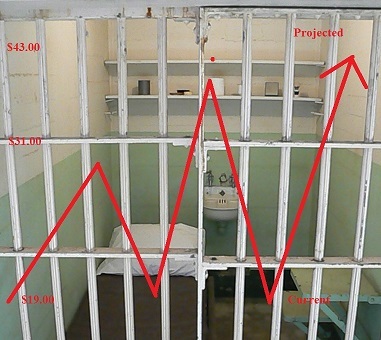 Based on sober market projections and an actual knowledge of the prison industry, it seems that now is the time to invest rather than divest in prison stocks in anticipation of high yields and a solid value growth potential. There is no danger of private prison companies loosing a significant amount of their inventory of human beings, which are very profitably subsidized by the American taxpayer.